Lydia does not have many marvelous things to write about in comparison with other countries, except for the gold dust that is carried down from Mount Tmolus. The earliest coins were not made of gold or silver but of electrum, a naturally occurring gold-silver alloy. The Pactolus River (Sart Çayı) beside the slopes of Mount Tmolus (Boz Dağ) in the kingdom of Lydia was one of the most important sources of electrum in the ancient world, and just as the rulers of the Middle East today have become wealthy from oil, so the ancient Lydian kings became rich by accumulating and minting coins from electrum. The capital city of ancient Lydia was Sardis (Sardes, Sardeis, Sart), and it was a major commercial center linking the Asian kingdoms of the east with the coastal Greek cities of Ionia, including Miletus. It is not an accident that the first coins appeared in the important commercial centers of Lydia and adjacent Ionia, nor that the first system of bimetallic currency—the first system of interrelated gold and silver issues—was also developed there. 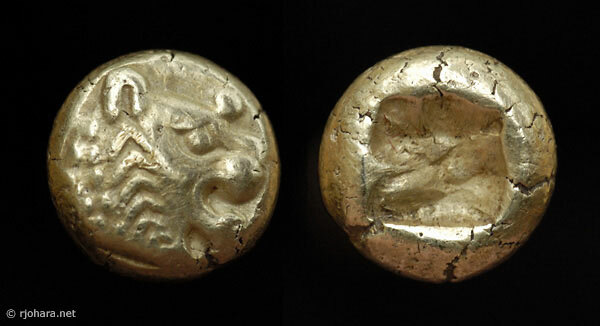 The electrum lion coins of ancient Lydia should probably be considered the world’s the first true coins, in the sense of a state-issued quantity of metal impressed with a consistent type. The earliest issues, thought to date from the reign of Alyattes (about 610–560 BC) or perhaps his predecessor Sadyattes—both of the Mermnad dynasty—feature the Lydian kings’ emblem of a roaring lion, almost always with a curious knob, often called a “nose wart,” on its forehead. Reid Goldsborough has written a very thorough review of what is known about the history of these electrum lion coins of Lydia, and his essay includes citations to the relevant technical literature on the subject. This type is known from electrum thirds (4.70 g), sixths (2.35 g), and twelfths (1.18 g), all with approximately the same design. The larger denominations typically have two incuse punches on the reverse rather than one. Rare examples are known with the lion’s lead left instead of right. Apparently part of the same series are a number of smaller fractions that feature a lion’s paw, although it is possible that these are Milesian rather than Lydian. Twelfth-stater specimens are less common than thirds, but are still quite well documented. RJO 55. Electrum 1/12 stater (1.19 g), about 610–560 BC. Obverse: lion’s head right with “nose wart.” Reverse: square incuse punch. A clear and well-centered example of Weidauer’s Type XVI, which is distinguished by the large number of chevrons on the lion’s neck (Weidauer, 1975: 24–25, pl. 10).